Tomatoes Got Talent @ TRIAD - Cabaret HotSpot! 12 uniquely-talented women have been hand-picked to compete in the 6th Annual “Tomatoes Got Talent” contest which celebrates the talents of women over 40. Hosted by Randie Levine-Miller, the high-spirited juried contest takes place at The Triad Theatre, 158 West 72nd Street, on Monday April 15 at 7pm. 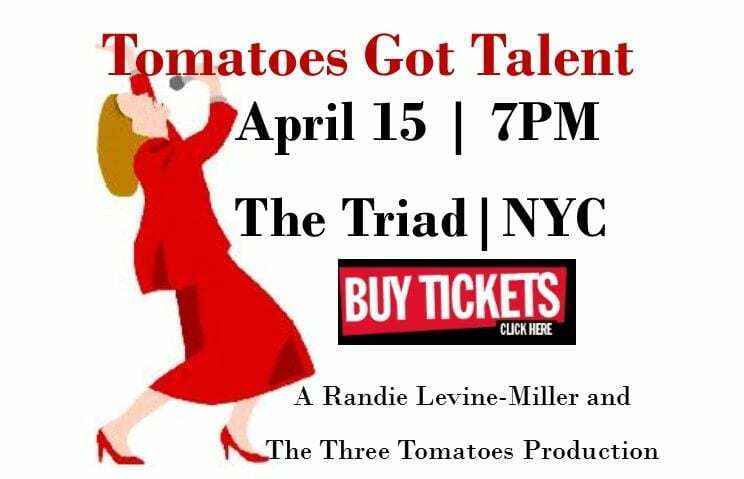 Co-produced by Levine-Miller and Cheryl Benton, the founder and publisher of Thethreetomatoes.com, which sponsors the event, “Tomatoes Got Talent” is a showcase for extraordinary women who have made their marks and their livings outside of the entertainment world, but who consider the craft of singing and performing to be integral to their lives. Serving as judges this year are three respected industry leaders: the award-winning media personality, producer, radio host Valerie Smaldone; theater critic, author, playwright and former Drama Desk president Peter Filichia, and Sandi Durell, TheaterPizzazz.com editor/publisher and reviewer. The reigning Top Tomato Sheree Sano, winner of the 2018 contest, will perform. The evening’s music director is Paul Chamlin. They’re a bushel of talent! Here’s who they are, and what they do: Maureen Griffin is the reigning Ms. New York Senior America. She is a legal secretary by day. Evangeline Johns is an 82-year-old blues singer. Before she retired from her day job, she was a market researcher for CBS. Terri Levy says singing and acting are her passions. She’s been a special-education teacher, a court reporter, and a realtor. Camille Diamond is director of a community center that serves children and families. Kelli Maguire works at a Manhattan youth center and grew up in a carnival. Amy Downey is a singing bank executive. She is COO of a major bank and loves performing. Rachael Epstein is a government contract worker in intelligence and a three-time cancer survivor. Delaine Douglas writes plays and short stories, and loves the Great American Songbook. Laura Lorenzo was an oncology nurse and is now a furniture sales person. She is the current runner-up in Ms. NY Senior America. Taffy Jaffe was a psychotherapist in her own private practice. After she retired, she started doing standup comedy. Christina Connors is a licensed massage therapist who also used to perform on cruise ships. Lynn Henderson has had many chapters in her life, including wife, mom, equestrienne, and businesswoman. She has been singing since grade school. Randie and Cheryl are so proud that the 2018 winner, Sheree Sano, and Tomatoes Got Talent alumi Teresa Fischer, Angela Leone and Susan Mack are up for MAC Awards, which takes place on Tuesday March 26.